Chevron, one of the world’s largest energy companies, found themselves wanting to improve some various sectors of the company. Wonderware California was able to support them reaching their goals in a quick and cost-effective method. Wanting to improve refinery performance and reliability while still reducing maintenance costs and simplify regulatory compliance, Chevron was able to gain much more with their use of Wonderware products. 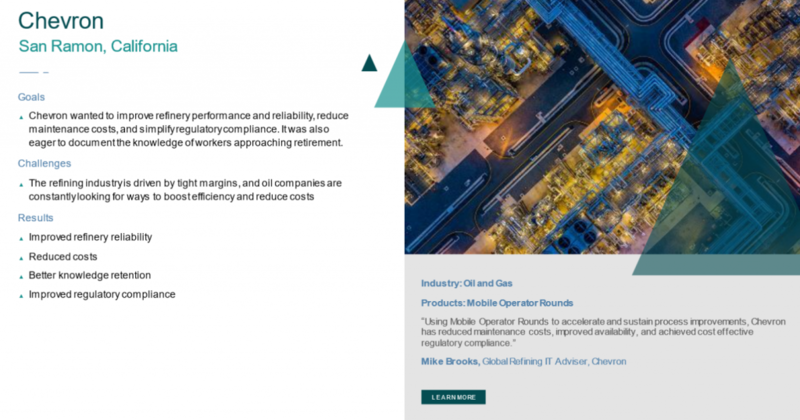 Not only were they able to achieve their goals of reducing costs, improving regulatory compliance and improving refinery reliability, but they also gained a better knowledge retention. Learn more about how Chevron achieved their goals here. To learn more about how you can take the next step towards your company’s goals, sign up for the Wonderware Enthusiast Summit here! This free two-day event will give you valuable tools and information that will can help your company achieve more.